Low calorie salads or salads with less calories are great for weight loss. Salads are a good source of fibre and vitamins like Vitamin A, B-complex and Vitamin C as they are loaded with vegetables and fruits. Indian salads often have curds and is known as raita. Low-Cal Salads like the Chawli, Rajma and Chick Pea Salad, Fruit Chana Salad are guaranteed to delight you, without using fattening ingredients like oil or cream in their dressing. Chockfull of fibre and nutrients, these salads are perfect to have any time of the day! What a vibrant sight this lovely Cherry Tomato and Methi Salad is! The contrast between the cherry tomato’s red and fenugreek’s deep green gives the salad an exquisite appearance, while their complementary tangy and bitter flavours impart an exotic flavour. A mild dressing of olive oil and lemon juice is just what the Cherry Tomato and Methi Salad needs to sharpen the other flavours and delight the taste buds! Serve this salad as soon as it is tossed, otherwise it will become watery. Want to add bulk to your diet? Try this bulky Cabbage Carrot and Lettuce Salad sure to add bulk as well as antioxidants like beta-carotene and vitamin C. You can also make salads with added cereals like our Cous Cous Salad, even though it has broken wheat it gives only 68 calories per serving. Indian meals are incomplete without raita. But making the same raita every now and then can be boring. Do you want to try new innovative recipes for raita? Spinach Raita can be relished with your favourite parathas or theplas. It is easy to make and is not at all bitter, thanks to the two pinches of sugar. Try your hands on this tangy Lauki Aur-Phudine-ka-Raita that’s got a cool minty flavour. You can enhance the color of your raita by adding beetroot like our recipe for this Beetroot Cucumber and Tomato Raita that’s brilliantly colourful and will tempt you with its good looks. It can be had on a hot summer afternoon to refresh your senses. 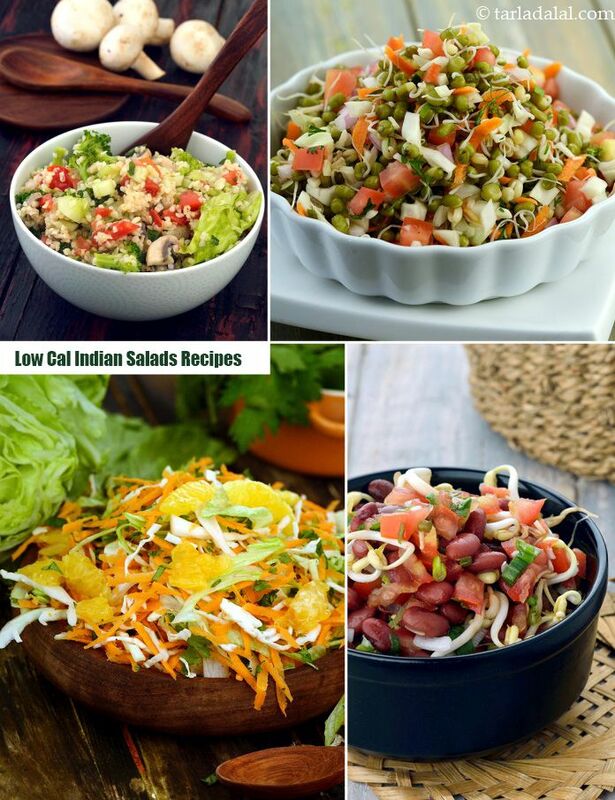 Try our other low cal salads, 60 Indian Low Cal Salad Recipes and do give us your valuable feedback.